We wanted to provide you all with an updated roadmap and some clarity on several community hot topics that have been affecting Switchblade over the past few weeks. We’ve been very active in discussing the current state of the game on our Discord server and social media channels, but we wanted to collate the information together for you into one place. We know it’s been a rollercoaster ride for the community in our transition to Free-to-Play, especially in terms of the matchmaking system, but we want you all to know that we’re truly grateful for your continued patience and understanding through the highs and lows as we try to deliver the best Switchblade experience we possibly can. The transition to Free-to-Play was a new experience for the team as well as the Switchblade community and we did our utmost best to ensure that things went smoothly. Whilst there were certainly a few bumps along the way that have severely impacted the community, we’ve been working hard on managing the bugs and issues as best we can whilst communicating our internal activities to our community whenever possible. This patch is our main bug fixing patch where we’ve put a lot of focus into working on some of the red hot issues the community has been experiencing in Switchblade. We are aware of other issues that are impacting players on both PC and PS4 and whilst 1.17 might not address those issues, we’re still hard at work on providing fixes for them. We’re continuing to investigate issues players are experiencing whilst working on fixes for bugs that we’ve managed to identify the source of. 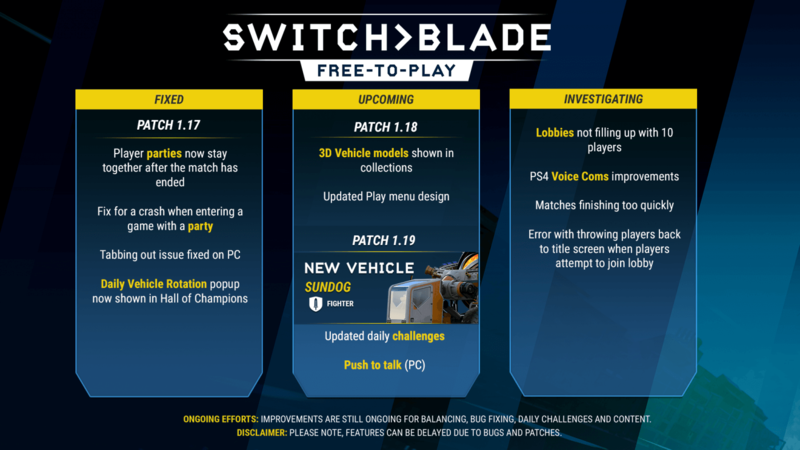 Of course, if there was any way in which we could have added in more fixes to improve the quality of life experience for Switchblade players, we would have done so, but game development is full of bumps in the road along with varying levels of complexity in the root cause of bugs and issues. Again, we’re grateful for your continued patience and understanding. Currently, when players form a party in the Hall of Champions and enter the matchmaking queue, not everyone from the party will successfully make it into the game lobby. Furthermore, at the end of a game, parties are split up and sent to separate instances of the Hall of Champions and need to re-invite their friends to reform the party. We are pleased to announce that both of these issues are being fixed in our latest patch that we are hoping to release some time next week! However, the end of game bug is only receiving a partial fix. If a team stays in the game and allows the lobby to roll over, the party will be placed back into the matchmaking queue as a party. However, if a party attempts to back out, they will experience the same bug that is currently live in the game and their party will be split up and need to reform. The reason this is happening is that once a team leaves the Hall of Champions, the instance that was hosting that particular hall closes and when the system attempts to find it again when a party leaves matchmaking together, it errors and disbands the party. We are investigating possible solutions for this issue but, unfortunately, we don’t have a timeline on this. In the current version of Switchblade, if you alt-tab out of the game whilst in matchmaking you might fail to be pulled into a game lobby. This also has the potential to happen on PS4 if you bring up any of the system overlays whilst matchmaking. What’s happening here is that the server is sending a handshake back to your game to tell you its found a lobby and wants to pull you into it, however if your game does not have focus/is not selected, the call won’t successfully connect to the game so you might end up stuck in infinite matchmaking queues or experience an error. This will be fixed in our next patch! Switchblade offers a daily rotation of 10 vehicles for Free-to-Play, Starter Pack and Epic Pack players to chose from when they enter a lobby. Until now, the only way to tell which vehicles were in the day’s rotation was to load into a game and check which vehicles had the small timer icon next to them. Now, we’ve enabled a feature that will display an overlay when players first load into the game to inform them of what vehicles are in the day’s vehicle rotation. This is a new content patch that refreshes the feel of the user interface whilst introducing a new look to the collections screen. We wanted to iterate and improve on our menu and user interface system to offer a more streamlined user experience and taking the opportunity to remove some currently redundant playlists and menu options. We’ve also been refining the collections screen to add in a new 3D render of the vehicles with animations and the ability to rotate and view it from all sides. We hope this better assists players in picking out a skin for their vehicle of choice and helps add to the character of the game! Whilst we’re not quite ready to talk about the content in this patch (it will get its own blog post closer to the time) we’re more than happy to report that the widely requested feature of push to talk (on PC) will be included in this patch along with updates to the daily challenges. We will also be adding a new vehicle to Switchblade, The Sundog! We are hard at work investigating ongoing community issues as well as discovering a few more ourselves as we play the game online with all of you. Most notably, we’re focusing on the issues outlined in the roadmap above but there are certainly more issues on our radar, such as getting stuck in the game’s tutorials on PS4, that we’re making good progress on. If you experience any bugs or issues with the game, you are welcome to report them on our Discord server or directly to our social media accounts. However, if you want direct support assistance, you would be best off contacting our support team via: support@switchbladegame.com. The team wants to continue to work closely with the community to improve the game, both aspirationally to ensure its the best possible vehicle action MOBA that it can be, but also refining the experience to get rid of any annoying bugs or delivering quality of life improvements. Keen eyes will have noticed several changes to the new roadmap than to the one we released in October 2018. As part of what we learned when transitioning into Free-to-Play, we started to gain an insight into running a game as a service and that’s caused us to rethink how we approach content delivery moving forwards. As part of that process, we will no longer be providing an estimated day or month for when a patch or content will be delivered until closer to the time. This decision was taken to allow a grace period for the unforeseen troubles of game development and running a live service. Whilst we run a tight ship here at Lucid and aim to stick to schedules, deadlines can slip based on new bugs or issues presenting themselves and the team wants to be agile in how we respond to them and being conscious of promising to deliver something by a specific date. We want to ensure that when we have a patch ready to go, it’s at the highest possible standard that we can achieve before moving on to the next one, whilst allowing for some flexibility in the development time and being transparent to our community with what features and fixes have been locked in to upcoming patches. Furthermore, the scale of the timeline has been reduced from giving an insight many months ahead to something that (we hope) will be delivered over the next month or so. This decision was made to allow the team to be flexible on what content we want to bring forwards and become more agile in how we respond to player demand. We didn’t want to find ourselves promising to deliver a certain type of vehicle or piece of content only to find that as we get closer to its release, the community or game data is revealing that we should consider releasing something else instead. We hope to deliver more frequent roadmaps as we move forward and gather community feedback on how they aid discussion around the development of the game. We hope that this decision will result in a more well-rounded and robust Switchblade experience for our community as the game continues to evolve. Finally, the roadmap no longer contains details on our next map, Monorail and an upcoming tank, Big Bob. First, to Monorail, we felt that the map would benefit from some more testing and refinement before releasing it to the community. On that point, we have been considering the idea of releasing some form of an alpha test for the map (maybe a temporary weekend or week-long event) where the community can playtest the map and provide the team with some valuable feedback. Lets us know on Twitter if you’d like that idea or give us your own thoughts on how best to gather feedback on the upcoming map! We also understand that current conditions surrounding playerbase activity and we didn’t want to split the playerbase such that full games became even harder to come by than they already are (were the community to be given two matchmaking options of Iceland and Monorail instead of just one). Secondly, to Big Bob, this vehicle is still in our production pipeline and will be released sometime in the future. We are currently working on a lot of vehicles and another one has been selected ahead of Big Bob to join the live game after The Sundog. We made this decision based on observations of the meta and vehicle selection patterns in the live game and we will be talking more about that vehicle in the months ahead. This post became a lot more in-depth and detailed than I had originally envisaged, so congratulations if you made it all the way to the end! But I hope you’ll agree that it contains a lot of information about our plans ahead as well as an insight into our current thinking and reasoning as to why certain decisions were made. For one final time, the team at Lucid Games wants to express their gratitude to the community for their continued support and assistance as we work on upcoming patches, content, and hotfixes for the game. As a thank you to the community, we’re currently investigating hosting a Double XP weekend to celebrate fixing the party system! Stay tuned to our social media channels for more information on that in late February/early March.